On October 3, 1942, an A-4 (later re-named the V-2) rocket was launched from Peenemünde, Germany. The rocket was the first to reach outer space, launching the Space Age. 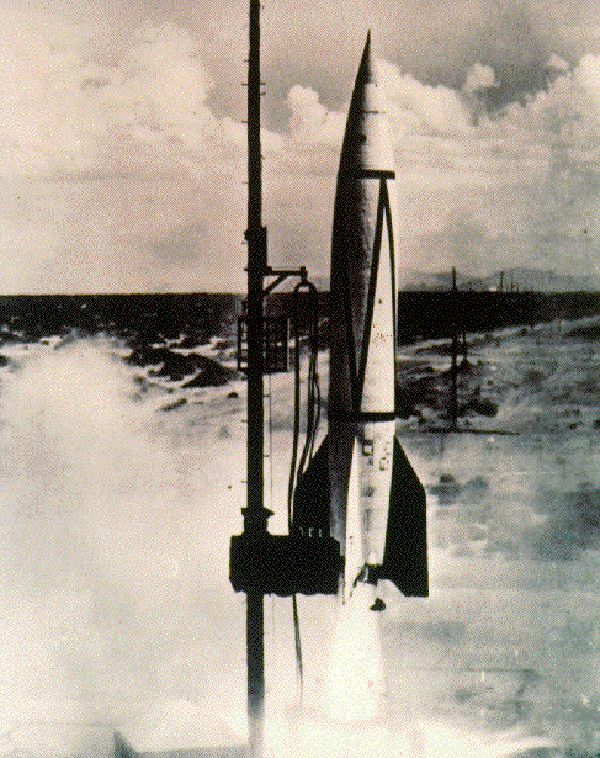 V-2 rockets like this one, developed in Peenemünde, Germany, by legendary scientist Wernher von Braun, used alcohol and liquid oxygen as fuel, and could carry a 748-kilogram (1,650-pound) warhead 362 kilometers (225 miles). The Wehrmacht, or Nazi military, may have used nearly 3,000 V-2s against targets in England and Belgium. On October 3, 1942, a rocket was launched from Peenemünde, Germany. The rocket traveled about 90 kilometers (56 miles) into the atmosphere before safely landing exactly where its engineers directed it, 193 kilometers (120 miles) away. This rocket, the first ballistic missile to reach outer space, started the Space Age. The rocket was developed by engineers of the Wehrmacht, or Nazi military. Originally called an A-4, the rocket was later re-named the V-2, and used for assaults on Allied targets in London, England, and Antwerp, Belgium. After the war, American and Soviet scientists raced to recruit Wehrmacht engineers to join their teams. Wernher von Braun, the engineer who eventually led the American space program, has been called “the greatest rocket scientist in history.” Von Braun’s development of the V-2 led to his design of the Saturn family of rocket boosters that helped send men to the Moon. projectile that moves on its own momentum and the forces of gravity and air resistance. (1919-1945) (Nationalsozialistische Deutsche Arbeiterpartei) having to do with the National Socialist German Workers' Party. to work to supply a group with new members. device that moves through the atmosphere by release of expanding gas. rocket used to augment a vehicle's thrust in order to exit Earth's atmosphere and dropped back to Earth once its fuel is used up. having to do with the Soviet Union and the areas it influenced. time characterized by national and business investment in space exploration and space technology, often dated from the launch of the Sputnik satellite (1957) or the development of the V-2 rocket (1942). person or object accused of something.